I have identified all of my 3rd great-grandparents and have their profiles on WikiTree. After that, it drops off significantly. I only have 45% of my 4th great-grandparents, 32% of my 5th great-grandparents; 22% of my 6th great-grandparents and 15% of my 7th great-grandparents. The average generation length in my family tree is 30 years. Curious about how that compares to others, I did some google searching and found this article on the International Society of Genetic Genealogy (ISOGG) wiki that highlights some studies that show generations to be around 25 to 30 years for females and 30 to 35 years for males. So my 30 year average generation length seems about normal. The average lifespan in my tree is 69 years, and has gone up the last couple of generations, as can be expected due to better health care. For my parents, the lifespan only includes my father’s data (77 years), as my mother is still living and is in her late 80s. My four grandparents lived to 58, 72, 80 and 87, for an average of 74 years. Prior to that, the average ranges from 64 to 68 years. Since to have become my ancestors, each of these people obviously lived to adulthood, it is understandable that the lifespan of my ancestors would exceed average life expectancies for their time periods, since life expectancies take into account people who die in infancy and childhood. The 2nd app lists all of the profiles in your pedigree chart that are missing at least one parent. You can find that app here. Out of 2046 possible ancestors in 10 generations, 400 (19.55%) have WikiTree profiles. 20/400 (5%) are duplicates due to pedigree collapse. I need to look deeper into the duplicate ancestors in my tree. I can think of a few off hand, but not 20! These are most likely all on my maternal grandmother’s line in Westmorland County, New Brunswick, where everyone’s related to everyone else. As for brick walls, I am certainly not working on all 109 of them! The main one that I’d like to break through is that of my 3rd great grandparents on my maternal grandfather’s line – John William Kirkland and Elizabeth Weeks. I wrote about my plan to work on that brick wall back in January. I’ve made a bit of progress, but nothing substantial to date. But I’m still plugging away at it, albeit with far less focus than I had hoped for! Last April, the Ottawa Public Library (OPL) and the British Isles Family History Society of Greater Ottawa (BIFHSGO) partnered to put on a day-long event called “Discover Your Roots: Genealogy and Local History Fair.” I was one of several BIFHSGO members who gave presentations that day and stayed around afterwards to answer questions and provide advice. It was a thoroughly enjoyable event! OPL has invited me back to deliver the same presentation, as part of their Fall genealogy programming. I will be doing so this coming Thursday, October 18 at the Greenboro branch. For more details and to register, please visit the Ottawa Public Library website. I have a few other speaking engagements in the works, the details of which will be available soon. I’ve created a Presentations page which lists my recent and upcoming presentations. I will update this page as details are finalized. As well, I have listed the talks I currently have available. If you would be interested in having me speak at your event, please contact me. My father’s full name was William Lockhart Cooper. As a kid, I found his middle name amusing and wondered who had locked is heart and did my mother have the key? Dad’s middle name was the maiden name of his maternal grandmother, Clara Lockhart (52 Ancestors #7), who died when my grandmother was 7 years old. It was only when I started researching that line that I found his namesake in the tree – my 3rd great grandfather, William Lockhart. William Lockhart was born about 1795 in Nova Scotia (exact location unknown). The Lockhart genealogy, “Lockhart families of Nova Scotia and New Brunswick“, says that he was possibly the oldest son of Timothy Lockhart and Elizabeth Teed of Sackville, New Brunswick. Those are the parents that most people have attributed to him in family trees. The only problem is, Timothy Lockhart and Elizabeth Teed’s youngest son was also named William, born about 1812. While it’s not uncommon for people to recycle names, that’s usually done when the first person of that name has died. My William Lockhart was very much alive when Timothy & Elizabeth named their son William. So I’m highly sceptical that these are the right parents, but I haven’t yet figured out who else it could be. Maybe DNA will help unlock this mystery. In 1829, William married Adelia Beckwith. At the time of their marriage, William was living in Moncton Parish. On the 1851 census, they were living in Salisbury Parish, Westmorland County with their 9 children, including my 2nd great grandfather, David H. Lockhart. I’m not sure what the H. stood for – perhaps this could be a clue to who William’s parents were. David had a son named John Harris Lockhart – could David’s middle name also be Harris and could that be a family name? In 1861, William was widowed and was living in Havelock Parish, Kings County with his 3 youngest children, next door to his married daughter Martha Matilda (Lockhart) Mills. In 1871, William was living with his son John and his family in Salisbury. Note that Salisbury Parish in Westmorland County borders Havelock County in Kings County, so although he moved counties, he likely didn’t move very far. I have not been able to find William after the 1871 census. He presumably died before the 1881 census, but to date I have found no death record, cemetery record or obituary. Don’t you just love ancestors who just appear out of thin air, with no apparent parents, and then just disappear again at the end of their lives! At least his name lived on. The last 52 Ancestors post that I wrote was at the beginning of April. It’s now the end of June. Oops! Although I got a bit (okay, a lot!) behind on posting, I do plan to get back to it. 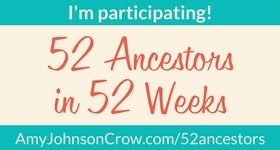 I’ve decided to continue to number them according to the week of the #52 Ancestors challenge and not in the order that I post them. So although the last one was #13, the next one will be #25. I’ll fill in the gaps in between when I can, but they won’t be sequential. I have an Index page that lists all of the prompts and the associated blog post, so if you’re interested in seeing which posts I’ve done (and which ones are still to come), that would be the best place to check. If you’ve ever been to Murray Harbour, Prince Edward Island, you’ve likely seen this house. It’s the most prominent feature in the village, although depending when you went, you may remember it as being blue, like I do. The house was built by my 2nd great grandfather, Senator Samuel Prowse (52 Ancestors #4), was passed down to his son, my great-grandfather, Albert, and then to my great-uncle, Gerald. I loved visiting Gerald and his wife Connie when I was younger, and exploring this great house! My great grandfather, Albert Perkins Prowse, was born on December 24, 1858, in Charlottetown, Prince Edward Island. He was the 2nd child of Samuel Prowse and Eliza Willis. He had an older brother, Frederick. Soon after Albert’s birth, the family moved to Murray Harbour, where Samuel went into business. Albert’s mother died after giving birth to a baby girl, Eliza Elizabeth, in Feb 1860. Tragically, the baby only lived for a few months, and Frederick died a couple of years later. Samuel Prowse then married his late wife’s older sister, Louisa Willis, and had two more children, William H. Prowse and Samuel Willis Prowse. Albert became a partner in his father’s business around 1879, then known as Prowse & Son. In 1884, his half-brother William joined the partnership, which then became known as Prowse & Sons. In addition to a General Store, Prowse & Sons exported dried fish, canned lobster and agricultural produce. The business included a starch factory, using local potatoes to produce starch, a lumberyard and a cannery, where employees made cans throughout the winter for use during the next canning season. Following Samuel Prowse’s death in 1902, William sold his share in the business to Albert, who continued the business alone under the same name. On November 29, 1881, Albert married Wilhelmina (Minnie) Kirkland at her parents’ home in Rexton, New Brunswick. The couple settled in Murray Harbour, where they raised a large family of 10 children over the next 21 years. Although their first child, Louisa, died before the age of 4, the remaining 9 children all survived. Preston Prowse (b. 1888), Samuel Prowse (b. 1891), Gordon Prowse (b. 1894), Vivia Prowse (b. 1897), Hon. Albert P. Prowse, Minnie (Kirkland) Prowse, Gerald Prowse (b. 1899), Louise Prowse (b. 1903), unidentified minister, Joseph Prowse (b. 1896), Pearl (Hobbs) Prowse and Fred Prowse (b. 1883) Missing – Edith Prowse (b. 1885). Photo likely taken around 1907. Along with following his father into business, Albert also followed his father into politics. He first ran for the Prince Edward Island Legislative Assembly in 1897, where he was defeated. He was subsequently elected in 1899 in 4th Kings, the riding his father Samuel had held between 1876 and 1889. Albert held the seat from 1899 to 1900, from 1904 to 1919 and from 1923 until his death in 1925. He was Speaker of the Legislative Assembly from 1918 to 1919. Albert died on Saturday, June 20, 1925, and his obituary was on the front page of the Charlottetown Guardian newspaper the following Monday. His funeral was held on June 22, 1925 in Murray Harbour, and was “one of the largest attended funerals in the community for a number of years”. Albert was buried in the Murray Harbour Cemetery. Once again, I’m profiling someone who is not a direct ancestor. This week’s prompt is “misfortune”, and nothing says misfortune quite like being a passenger on the Titanic. The passenger in question was Charles Leonard Kirkland, younger brother of my 2nd great grandfather John W. Kirkland. At the time of the 1861 census, Charles, then aged 20, was living in Richibucto, New Brunswick with John and his family, including my then 2- year-old great-grandmother, Wilhelmina Kirkland. Charles and John were both cabinet makers and were both Baptists. Charles would eventually become a Free Will Baptist Minister. Three years later, in 1864, Charles married Rachel Warman. They had 9 children over the next 20 years, some of whom were born in New Brunswick, others across the border in Maine. Two years after Rachel’s death in 1896, Charles married Nellie (Carver) Wheeler, a divorcée with four children. In 1900, Charles, Nellie and her four children were living Dover, Maine, where Charles was working as a clergyman. That marriage appears to have been short-lived. Charles became a well-known preacher who led revival meetings throughout New Brunswick, Maine and frequently in Saskatchewan. In the summer of 1911, Charles spent three months preaching in Moose Jaw, Saskatchewan, while he was visiting his sister Emma (Kirkland) Withrow, who lived in nearby Tuxford. In late 1911, Charles travelled to Glasgow, Scotland, reportedly to settle an uncle’s estate, but I’ve yet to be able to confirm that. There was a Kirkland who died in Glasgow in Sept 1911, but I’ve not been able to substantiate the family connection. He was much too young to have been Charles’s uncle. But in any case, there is no doubt that Charles was in Glasgow, as he wrote a letter to his daughter Maud in March 1912. In that letter, he mentioned that a coal strike was making it difficult to book passage home. I’ve often wondered if my great-grandmother Minnie even knew that her uncle was on the Titanic. I suspect not, as there was nothing in the PEI newspapers about it. As Minnie’s husband, Albert Prowse, was a politician at the time, a local connection to the Titanic disaster would surely have been a subject of great interest. Much of what I’ve learned about Charles Kirkland comes from his profile on Encylcopia Titanica, although the information on his parents differs from what I have found, which I discussed in an earlier post. As always, sources I’ve used can be found on Charles’s WikiTree profile. For this week’s theme of “Lucky”, I used a random number generator to pick the ancestor I would profile. I asked for a number between 1 and 500, and got #253, which I then compared against an Ahnentafel Report of my ancestors. So by the luck of the RNG, this week’s ancestor is Eva Magdalena (Sarah) Somers. She did have an slight advantage in getting selected, since she is in my tree twice! I’m a descendant of two of her sons, Ephraim Allen and Matthew Allen. Ephraim’s grandson, Isaac Trenholm Allen, married Matthew’s daughter, Miranda Allen. Isaac and Miranda Allen were my 3rd great grandparents, which makes Sarah both my 5th great grandmother and my 6th great grandmother. Luck comes into this profile in other ways as well. I’ve been very lucky in that other descendants of Sarah Somers and her husband, Benjamin “Shy Ben” Allen, have been researching this line since long before I ever gave family history a thought. Most of what I know of this branch of my family tree comes from the work of others – in particular, Barbara Trenholm-Merklinger, whose website Trenholm.org, published in 1999 and last updated in 2011, is still my first go-to site for sorting out the many children of my Allen and Trenholm ancestors, and Arthur Owen, whose family tree intersects with mine in several places. In addition to his tree on “Our Maritime Ties”, Arthur has documented much of what he knows about these ancestors on WikiTree. I am grateful to both of them for sharing their many decades of research so openly! The first story I read about Eva Magdelena (Sarah) Somers was on Barbara Trenholm-Merklinger’s site, in her introduction to the Allen family. The story is told that Benjamin Allen was extremely shy, hence the name “Shy Ben”. One night after returning from a long trip, he found a New Year’s Eve dance in progress at Fort Cumberland. After suitable liquid fortification, he went to the center of the dance floor and said: “I am in dire need of a wife! Who will have me?” Up stepped a hearty lass of German descent, Sarah Somers, who said “I’ll have you, Ben!”. The happy couple were married on the spot by a minister who happened to be in attendance. It is said that any pugnacious tendencies in the Allen female descendants can be attributed to Sarah. This “hearty lass of German descent”, was born in Whitefield, Pennsylvania in 1753. Her parents were Mathias Somers/Sommer and Maria Christina Null, who were both born in Germany and married in Pennsylvania in 1749. The Somers family was among the original group of German families in Philadelphia who settled the Monckton Township on the Petitcodiac River in what was then Nova Scotia (now Moncton, New Brunswick), in 1766. On January 1, 1771, a month shy of her 18th birthday, Sarah Somers married Benjamin Allen, some 20 years her senior. They had 12 children, most of whom also had large families – my 4th great grandfather, Matthew Allen, had 11 children and my 5th great grandfather, Ephraim Allen, had 15 children (with two wives). As a result, there are likely thousands of descendants of Sarah Somers and Benjamin Allen alive today, many of whom show up among my DNA matches. Even if the likelihood of matching a 5th or 6th cousin is low, the shear number of them means that I match a lot of Allen/Somers descendants. How many of them have pugnacious tendencies has yet to be determined. I live in Ottawa, Ontario. You can find me on WikiTree. A full profile, including sources, for any ancestor I mention on my blog can be found on WikiTree, as this is where I document most of my genealogy research. Follow the links. Leanne Cooper Genealogy Powered by WordPress.com.